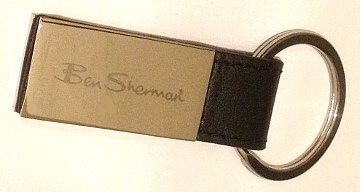 Highly Polished Steel and real Leather BEN SHERMAN designer branded large Keyring. Large 35mm keyring and 60mm x 20mm size designer steel key tag attached. High Polished steel loop attached to genuine leather and Polished Steel screw fixed Keyring Tag with Ben Sherman logo on front and 4 screws on show in back with polish steel surface.